The best cars for teen drivers, naturally, should also be the safest cars for teen drivers, since protecitng your teen driver is your first priority. You'll also want a car that is both affordable and reliable.We are here to help. They keep fuel costs low with an EPA rating of at least 20-mpg combined. Since safety is a huge factor for teen drivers, in addition to earning a "Top Safety Pick" designation from the IIHS, all of our vehicles are at least a 2014 which means they come with electronic stability control (ESC). ESC was required as standard equipment on vehicles starting in 2012. ESC helps drivers regain control of a vehicle during a slide and can be a real lifesaver. According to Anne McCartt, senior vice president for research at the IIHS, ESC is a must. "Parents should never consider any vehicle that doesn't have electronic stability control," she said. What your teen is looking for in a car and what you want them driving are often two different things. Boring is the way to go, according to Penny Gusner, consumer analyst with CarInsurance.com. "Parents need to look for a boring, used car with lots of safety features. You want a car that the teen isn't going to drive beyond their skills. Sedans are popular choices for novice drivers." The recommended vehicles range from a smaller car, like the Honda Civic, all the way up to the Hyundai Tuscan SUV. After safety, most parents are looking for affordability. Unfortunately, all of our vehicles broke the $10,000 barrier with the cheapest vehicle coming in at $10,999. The rest fell within our $15,000 budget with the Prius (the only hybrid on the list) pushing the envelope a bit at $15,995. The most expensive vehicle on the list busted our budget by $2,600 but we wanted to include a 2016 model. Depending on what version of the Tucson you end up buying it could be loaded with safety features that not only keep your child safe but could also result in a big insurance discounts. Tucson Sport and Limited models come with blind spot monitoring, lane change assist, and rear cross traffic alert. If you bump up to a used Tucson Limited expect lane departure warning, rear parking sensors, forward collision warning, automatic emergency braking, and adaptive headlights. McCartt likes the bigger cars for teen drivers. "When thinking about safety, parents may focus on features like the number of airbags, but a key part of crash protection is a vehicle's size and weight. Bigger, heavier vehicles are more protective in crashes than smaller, lighter ones," explains McCartt. Whatever car you choose, make sure your teenager feels comfortable behind the wheel of the car they will be driving, advises Carl Anthony, Managing Editor of Automoblog. Sports cars are an obvious no-no. Teen drivers don't need the horsepower. “I would not recommend putting your teenage driver in a sports, performance, or muscle car,” says Anthony. Now it's time to look at one of the biggest cost factors, insuring your teen. While you certainly love your teen, there is a good chance your insurer will not. Car insurance for young drivers, whether you add them to your policy or they get their own, is always expensive. Teens bring stacks of risk to the table and insurance companies will charge you for that risk. 2,820 teenagers ages 13-19 died in motor vehicle crashes in 2016. 53 percent of motor vehicle crash deaths among teenagers in 2016 occurred on Friday, Saturday or Sunday. These depressing stats are a major reason for your impending premium increase. "Parents will normally see their car insurance bill double when adding a teen," says Gusner. "A premium increase of anywhere from 100 to 200 percent is common." Let's look at the numbers and see just what a teen will do to your rates. Meet the Smith family. Abby (the mom) is 40, has a spotless driving record and is the primary driver of a 2015 Toyota RAV 4 LE. Jack (the Dad) is a bit older at 45, also has a spotless driving record and cruises around town in a 2016 Honda Accord LX. When we ran the numbers, the best full coverage quote we could find for Jack and Abby was $3,468 a year, while the most expensive premium clocked in at $3,840. While the difference between these two is only $372, this still illustrates the fact that insurers rate risk differently, and shopping your coverage on a regular basis is extremely important, in many cases the difference between quotes can be much larger. Keep in mind that while this list highlights the rate differences between cars, it does not necessarily reflect what your household will pay for car insurance. Your rates could be lower or higher. The biggest factors that affect your premium are your ZIP code and your teen's driving record. Assign the teen to your policy. Adding Steve the teen to the parent’s policy ended up being the most affordable option but was still very expensive. The best rate we could find was $5,844, a whopping $2,376 increase. The worst rate we came across was a budget-busting $7,260. Buy the teen a late-model used car. Putting Steve in his own late model car results in a pretty impressive premium jump and turned out to be the most expensive option. We chose a 2016 Subaru Impreza and the best rate we could find for the family was $7,476 while the most expensive policy was $9,216, a shocking $5,748 increase. Buy the teen a beater car. Putting Steve in a beater lowered the premium a bit but it’s still unbelievably expensive. When we dropped Steve into a 2010 Nissan Versa (liability only for the Versa) the family premium dropped down to $6,600 with the most expensive option coming in at $8,352. 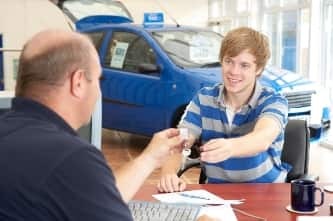 Giving the teen his own beater car and policy: Lets dump Steve off the family policy, keep him in the 2010 Nissan Versa and get him his own policy with liability only. The best premium comes in at $3,588 while the worst was a shocking $10,224. This is a difference of $6,636, which should make it crystal clear that shopping your coverage can definitely save money. While $3,588 doesn’t seem too bad, when you add in the rest of the family it totals up to $7,056,which is still a pretty hefty bill. It should be noted that this option is only available to parents whose teen is at least 18 years old. Any younger and they are unable to legally enter into a contract such as an insurance policy. Be a role model: "A well-trained driver is the most important safety feature in any car," says Doug Herbert, founder of Put On The B.R.A.K.E.S. "Practice frequently with your teen driver and be a good role model behind the wheel." Make the consequences clear: Make if very clear to your teen what will happen if they get a speeding ticket or even worse, a DUI. “A D.U.I. ticket will cost teenagers big time. As a teen driver, you'll likely be cancelled and if you can get insurance, expect to pay a much higher rate for the next 3-5 years. Traffic crashes and citations will also impact your premium. Rack up more than three and teens face cancellation or non-renewal,” warns Carole Walker, Executive Director of the Rocky Mountain Insurance Information Association. Teen-driver course discounts: Many insurers offer safety courses or programs targeting teens. Most come with some type of discount once your teen completes the course. "Ask your insurer if there are discounts for a driver's education course or if they have a teen program," says Gusner. State Farm has Steer Clear, Safeco has RightTrack, and American Family has Teen Safe Driver Program." These programs usually involve driving training via an app as well as monitoring their driving via the app or a plug in device. Once your teen completes the program a discount is applied to your policy. Defensive driving course: If your teen has been trained on how to deal with less than ideal situations out on the road it should lessen their odds of getting into an accident, which is music to an insurers ears. Check with your insurer to see if they offer a discount for completing a defensive driving course. Discounts vary but 10 percent is fairly common. Consider the Car. If you are putting your teen in a newer vehicle, look for one that has teen specific safety features. “New Chevrolet vehicles utilize a feature called Teen Driver, which employs a number of parental control settings. For example, parents can set a speed alert, limit radio volume, and access an in-vehicle report car that gives them an idea as to how their teenager is driving,” advises Anthony. “Don't assume an old clunker is your best insurance bet. Newer makes and models are designed to be safer and discounts may be available if you have automatic seatbelts and airbags, as well as other active safety features,” says Walker. Buy umbrella coverage. Consider an umbrella liability policy. In our litigious society, you may want to have an extra layer of liability protection. For about $150 to $300 per year, you can buy a $1 million personal umbrella liability policy. Good student discount. Tell Junior to keep his grades up. “Most insurers offer a discount, some as high as 25 percent, for students who maintain at least a B average,” says Walker. Raise deductibles. Bumping up your deductible can be a major money saver, as long as you can easily afford it. Doubling your deductible can shave 10 to 20 percent off of your premium. Always choose a deductible that you can afford in the event you have to make a claim on your policy. Bundling: If you carry a variety of policies with your insurance company you should be getting a bundling discount. “If you have homeowners, renters or life insurance with the same insurer, ask for a discount. Bundling can be a significant money saver, up to 25 percent,” says Gusner. Policy adjustments for college. Once Junior is ready to head off to college you may be able to lower your premium, especially if they are headed to a college over 100 miles away and will not be taking a car with them. "When your teen heads off to college, you may be eligible for lower premiums, provided the car stays behind. Many insurers will reduce rates for students attending a school at least 100 miles away from home who do not have a car on campus," says Gusner. Insurance rates are for an 18-year-old male in ZIP code 80104 (Castle Rock, Colorado) commuting 20 miles each way to school, with no accidents or violations. Coverage includes $100,000 bodily injury liability (up to $300,000 per accident) and $50,000 in property damage liability, $10,000 in personal injury protection and comprehensive and collision coverage with $500 deductibles. 0 Responses to "2019 Best cars for teens"